(CNN) — Deciding where to travel in June can be tough. School is out in many parts of the Northern Hemisphere. Families are flocking to beaches and national parks, and prices for airfare and accommodations are rising steadily with temperatures in this part of the world. It can feel like there’s nowhere to turn. You’ll likely encounter larger crowds and higher prices at most destinations with pleasant weather this month, but you needn’t fret. We’ve done the travel research for you. 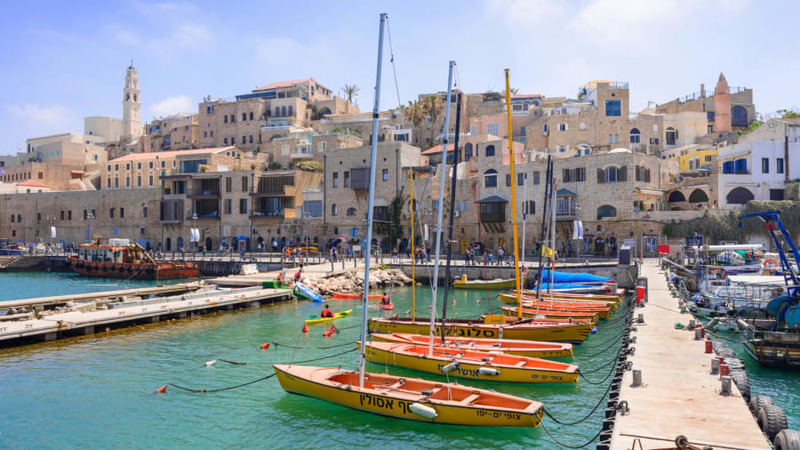 Spring and fall are Tel Aviv’s less-expensive shoulder seasons, but there’s a reason summer is its most popular. 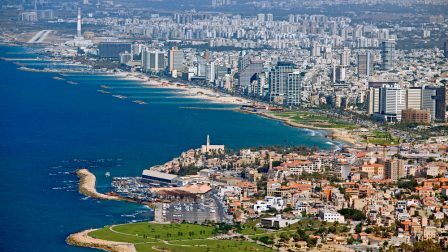 Europeans, in particular, flock to Israel’s Mediterranean coast this time of the year. On June 28, Tel Aviv will be celebrating White Night — an all-night event for which many restaurants, bars, shops, galleries and museums won’t shut their doors. In commemoration of Tel Aviv’s White City being named a UNESCO World Cultural Heritage Site, there will be music, art and dance performances all over the city, all night long. While Asheville is a popular spot year-round, many head there in fall to watch the leaves change. Nestled in the Blue Ridge Mountains, autumn is a truly beautiful time of the year, but June’s temperatures are pretty moderate for the American South, with highs in around 80 degrees Fahrenheit (26 degrees Celsius) and cooler, pleasant nights. Hiking is still comfortable this time of year — especially if you’re near water or under tree cover. And, of course, there are lots to be eaten and drunk here. Asheville is known for being a beer city. The city has 26 craft breweries, and about 60 in the greater region and craft beer giants such as Sierra Nevada and New Belgium have set up shop here. — Highland Brewing Company Independently owned since 1994, Highland Brewing paved the way for craft brewing in Asheville. Try the Burly Rye Stout or the High Flyin’ IPA for something on the lighter side. — Wicked Weed Brewing Wicked Weed opened with a focus on “West Coast hoppy ales and authentic Belgian ales brewed to inspire those who drank them.” It wasn’t long before they began garnering lots of attention. In 2017, they entered into a partnership with Anheuser-Busch. Try the Ginger Saison or Rose Gold Belgian Ales. — Burial Beer Co. Located in Asheville’s South Slope district, Burial began brewing as one-barrel system in 2013. Within a year they were at 10, and they’ve been steadily growing ever since. Try the Thresher Saison or the Billows Happy Kolsch. If you are in the mood for something a bit more herbal, book a tour of Eda Rhyne Distilleryand partake in their Appalachian Fernet or Amaro Flora. Be sure to call ahead. Or, indulge in smaller plates, at Chef Katie Button’s Spanish tapas bar Cúrate. Sunday brunch is taken almost as seriously as beer in Asheville. 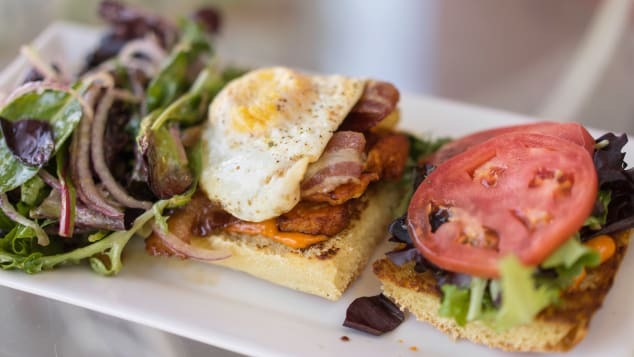 Avoid the crowds downtown and get a shawarma (add the fries) or fried haloumi egg sandwich, at West Asheville’s Lebanese street food restaurant Gypsy Queen Cuisine. Now that you’ve eaten, take a drive on the Blue Ridge Parkway. If you want to stretch your legs and hike a bit there are countless trails you can easily access. Here are a couple of suggestions: The Graveyard Fields Loop is a moderate 2.9 mile (4.6 kilometer) hike that with great views and a waterfall to cool off by. Pink Beds is a relatively flat, 6 mile (9.7 kilometer) loop that features a river and gorgeous flora and fauna. Sure, St. Petersburg is warming up now, but the real draw of visiting this time of year is the White Nights Festival (May 26-July 23). Situated on the Bay of Finland in the Baltic Sea, St. Petersburg is the world’s northernmost city with a population of one million or more. It has the same latitude as southern Alaska and experiences nearly 24 hours of day light during these summer months. After a long, dark winter, St. Petersburg is ready to celebrate — all day and night long. 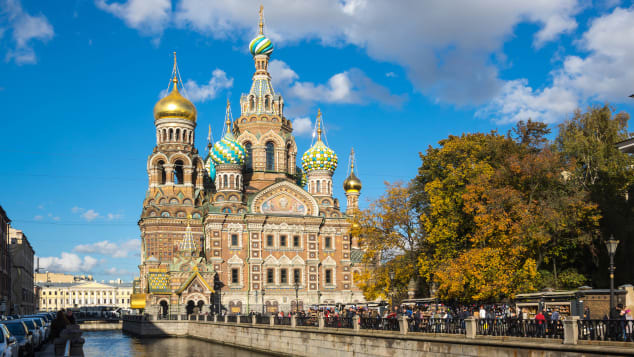 Russia’s second-largest city is a rich cultural and historical destination, and during the season of midnight sun, museums, shops, restaurants, bars, theaters and concert halls keep their doors open late (or, early, depending on how you look at it), so you can fit a lot more into a short trip now. Just make sure to pack an eye mask to ensure you can get a few hours of sleep after exploring the city into the wee hours of the morning. This is a busy time of year, especially with matches taking place here June 14-July 15 for the 2018 FIFA World Cup. Keep this in mind when booking accommodation, performance tickets and making reservations. The Stars of the White Nights Festival (May 26-July 23) features more than 200 orchestral, ballet and opera performances every year at the Mariinksy Theatre, Mariinkey II (New Theatre) and the Mariinsky Concert Hall. Created by maestro Valery Gergiev in 1993, the program boasts some of the biggest Russian and international stars in music and theater world. It has become one of the most popular events during White Nights. Tickets are in high demand and typically sell out weeks in advance. Consult the Mariinksy Theater website for this year’s schedule and ticketing information. Looking for something more contemporary? Palace Square puts on huge concerts each year, featuring big international acts such as The Rolling Stones. The Scarlet Sails celebration on June 23 marks the end of the school year and is probably the largest event of the White Nights Festival. This massive public event includes several stages of free music and ballet as well as rowing and motorboat races, and pirate ship battles on the Neva River. The main feature of the event (and its namesake) is a large ship with scarlet sails making its way across the river amongst a backdrop of fireworks. Make sure to save time to explore the Hermitage Museum, which contains over 3 million pieces of Western European art. Only a small portion of these are on display in the museum’s 360 rooms. Even more can be viewed at the Staraya Derevnya Restoration and Storage Center. The Church of Our Savior on the Spilled Blood, Bronze Horsemanmonument and Peter and Paul Fortress are not to be missed. Good thing you’ll have enough hours in the day this time of year to fit it all in. Croatia has gone from being a less-expensive alternative to Italy or Greece to a major destination in its own right. So much so that places such as Dubrovnik have made lists of places not to visit because of the influx of tourists. From Roman architecture to crystal-blue waters, there’s a reason “Game of Thrones” films here and that crowds are growing. Split, Croatia’s second-largest city, is situated on the Dalmatian Coast, and its port is a island-hopping launching off point. It’s less touristy than Dubrovnik and offers ancient ruins, beautiful beaches and stellar cuisine. Get a taste for Split’s Old Town and stay at the stylish Marmont Heritage Hotel. You’ll have easy access to the beach, Marmont Street and the UNESCO World Heritage Site, Diocletian’s Palace. 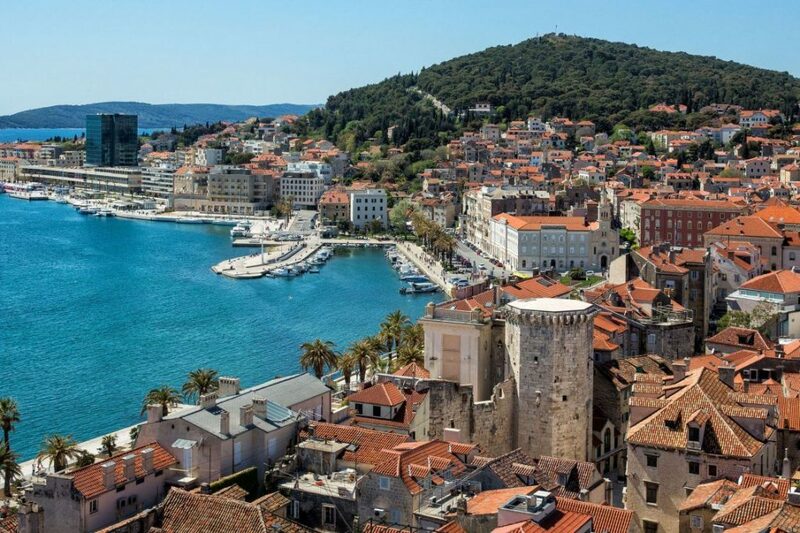 Built at the beginning of the fourth century AD as a retirement residence for Roman Emperor Diocletian, the palace, walls and gates are some of the last remains of that era in Split and are not to be missed. The Cathedral of St. Domnius is located in the Mausoleum of the Roman Emperor Diocletian. Named after Split’s patron saint and third century bishop of Salona. Some of its most stunning features include Corinthian columns, as well as wooden doors and choir seats built in the Romanesque-style (that are some of the oldest of their kind in Dalmatia). The ancient ruins of the city of Salona are just northeast of Split and are worth the short excursion. It became the Roman capital of Dalmatia in 9 AD, but first mention of the city dates back to seventh century BC. While many of Salon’s artifacts are on display Split’s Archeological Museum, there is still plenty to see at this sprawling site. You’ve surely worked up an appetite after all this exploring. Get a taste for Dalmatian cuisine at Konoba Marjan, a local favorite featuring fresh grilled fish, outdoor seating and fine wines. Now, let’s get to the beach. Visitsplit.com recommends Bačvice if you’re looking to mingle. 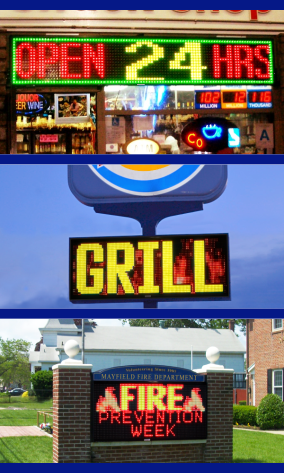 It is known for its nightlife and will keep you occupied until the early hours. Trstenik’s beach pebbled beach offers more seclusion. If you want to get some exercise, Kaštelet is about a 20-minute walk from the city center. The peaceful Marjan Forest Park is just above the beach and offers trails with scenic views. A summer vacation by the water doesn’t necessarily mean you need to be ocean-side. A reservoir of the Colorado River, Lake Powell is on the border of Arizona and Utah. June is perfect bathing suit weather here, with highs averaging 90 degrees Fahrenheit (32 Celsius) and an average water temperature of 70 degrees Fahrenheit (21 Celsius). June is ideal for a Lake Powell getaway: The spring can be a bit unpredictable, and you’ll likely need a wetsuit for activities such as waterskiing. Meanwhile, July and August can bring brutal heat. The first thing you may want to consider when planning your trip is what type of accommodation best suits your needs. Lake Powell Resorts & Marinas offers a wide range of options: Are you a resort or lodge type of person? How do you feel about houseboats? (They come in the economy, mid-range and luxury variety.) Do you prefer to camp? You can bring your own RV, rent a high-end Airstream or pitch a tent. Now that that’s sorted, let’s move on to activities. There are tons of those. Kayaking, canoeing, and paddle boarding are all great options. If you don’t have your own equipment, you can rent through Kayak Lake Powell. They can set up guided tours and group trips for you as well. A Rainbow Bridge boat tour might be a better fit for those looking for a less strenuous way take in the sights. 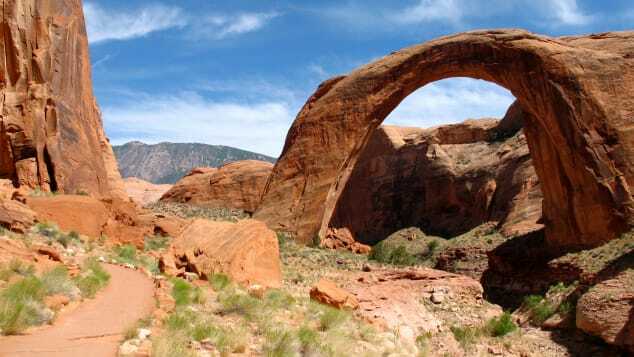 You’ll coast along 50 miles of Lake Powell shoreline and stop near Rainbow Bridge National Monument (one of the world’s largest natural bridges) and hike about 1.25 miles (2 kilometers) to explore the natural wonder on foot.